Radiculitis, or radicular pain, is a transferred pain that is discharged along the path of a nerve branching out from the spine. The pain is felt due to pressure on the nerve root at the point of its connection to the spinal column. This pressure on a nerve that causes radicular pain is connected to inflammation and can be caused by several conditions, like herniated disc or osteoarthritis. With cervical radiculitis and lumbar radiculitis, where the spinal nerves branch out to the arms and legs, radicular pain can be felt all the way to the feet and palms. Down the length of the spine, nerves exit through holes in the bone of the spine called foramen. These nerves branching out of the spinal column are called nerve roots, or radicular nerves. They open up from the spine and go along different parts of our body. Nerves that exit the cervical spine travel down through the arms, hands, and fingers. That means that issues affecting nerve roots in this area can radiate pain through your arms and hands – radiculopathy. Low back issues affecting lumbar nerve roots can release pain through your leg and foot – also known as sciatica (sciatica stretches). 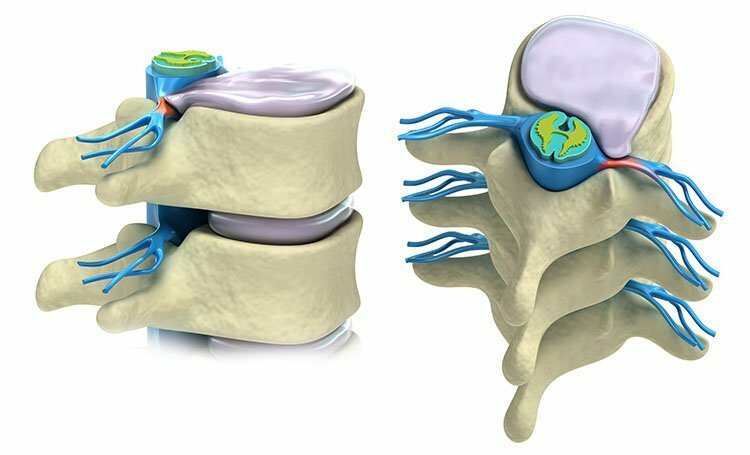 As there is no spinal cord in the lumbar spine and the spinal canal is more spacious in the low back, complications and injuries in this region usually cause nerve root problems, not spinal cord injury. Even large disc herniation or fractures in the low back are less likely to cause permanent paralysis than further up the spine. Lumbar radiculitis – Lumbar radiculitis is a compression of nerve roots in the lower part of the back, called lumbar spine. The most common lumbar radiculitis is sciatica, or radicular pain emanating from the sciatic nerve. The pain can radiate from the lower spine to lower back, glutes, upper thigh, calf, and foot. To read more about the causes and symptoms check lumbosacral neuritis. Your risk of developing most of these causes of radiculitis is increased by factors such as age, obesity, smoking, genetics, poor posture and stress on the spine. Radiculitis symptoms can vary from one patient to another, depending on the location of the affected nerve root. Weakness – muscles weakness is often a companion of compressed nerves. Weakness in the arms or legs can interfere with mobility and make patients favor certain muscles. Depending on the severity, muscles in the toes, feet and calves may start to atrophy over time. This usually means they may require physical therapy for full recovery. Radiculitis is also known to cause patients to favor certain side of the body, which can result in the over development of that side relative to the one that don’t get used as much. A compressed nerve can in rare occasions cause a serious condition called cauda equina syndrome, which affects a group of nerves in the lower back. This is a medical emergency that requires immediate surgical treatment, especially if the pain is accompanied by a loss of bladder or bowel control (call 911 ASAP!). Most cases of radiculitis can be managed by noninvasive treatments, such as physical therapy and heat and cold application. Surgery is only recommended as last resort and in advanced cases, depending on the spinal condition and the underlying cause. Steroid injections – Corticosteroid medication can be injected directly into the affected portion of the spine. It is also helpful for temporary relief of moderate to severe pain, but the cost can be high. When nonsurgical (noninvasive) treatments fail to relieve the radicular pain other symptoms after 2-4 weeks, your doctor may recommend surgery. There are various minimally invasive spine procedures that can be used to treat numerous underlying conditions which cause radicular pain. Decompression surgeries release the compressed nerve by treating bone spurs or herniated discs. There are other outpatient procedures available for radiculitis treatment, but his may depend on your GP. According to this interesting research, the procedure that will be recommended to you may depend on who you are referred to, with neurosurgeons performing mostly decompressions, whereas orthopedic surgeons performing more fusions. Fortunately, the same study shows similar reoperations rates for both procedures and finds high-volume surgeons more reliable. Conclusion: What is the Right Treatment for Me? After diagnosis and identification of the underlying cause, your doctor will prescribe your treatment. Treating radiculitis involves treating the underlying condition causing it. If the condition is not severe, the treatment will start with a non-invasive treatments plan, as mentioned above. The plan will include rest, anti-inflammatory medication, stretching and exercises. With cervical radiculitis and lumbar radiculitis, where the pain can spread to the arms and legs, pain management medication will be involved. If the condition has progressed far enough, and your doctor thinks there might be some nerve degradation, physical therapy will be recommended for full recovery. Only once all conservative treatment options are exhausted, surgery will be considered. However, even if it comes to this you should not be worried. There are relatively modern procedures like decompressions and fusions that are minimally invasive. Just make sure to ask for a high volume surgeon for the highest chance of success without needed reoperation. Good luck on your road to recovery. Cheers!